Where sports lovers can enjoy brews, American eats, and all the sports they want to watch. 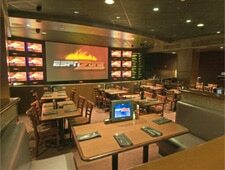 : Billing itself as the ultimate sports dining and entertainment venue, ESPN Zone exists solely to entertain. Yes, there’s a menu featuring all-American fare, from Maryland crab soup to cheeseburger pizzas, baby-back ribs and meatloaf, but the steady stream of visitors filing through the front door to whoop it up may be more interested in playing games than eating. You can stick with low-price fare with the pastas and sandwiches or splurge on something pricier. With about 200 television sets simultaneously broadcasting sporting events and with the general hullabaloo, the decibel level is deafening---this is not the place for conversation, unless you know someone well or don’t want to know someone well. Laid out on three levels, ESPN Zone offers a sporting outlet for everyone, particularly if you want to try your hand at something downstairs in the gaming room.